There's so much story and character here that the play easily could be three hours long (or maybe be made a 10-hour Netflix series) and still not cover everything. But Shepard wisely kept it to a sparse 70 minutes that still gives you a full picture of who these people are, even if you don't know every detail of their backstory. That is left to the audience to fill in. One of the things to contemplate is just who the "fool" in the title is. Eddie? May? Their parents? The old man? Maybe all of them. This is the kind of pain-soaked love story that makes one happy to live alone with cats. As Elphaba sings in Wicked, "if that's love it comes at much too high a cost." Dark and Stormy started out five years ago performing in various non-traditional spaces around the Cities, but in the last few years they've settled into their studio space in an arts building in Northeast Minneapolis. This intimate setting with about 40 audience members on chairs circled around the performance space, consisting mostly of a bed and a chair, makes one feel like they're right in that seedy motel with May and Eddie, so up close and personal it's almost uncomfortable. There's a large pole in the middle of the space that could be awkward, but they always find an interesting way to make it work. Here it serves sort of as the doorway to the room around which the actors circle restlessly, and against which the old man leans in his chair, drinking out of a bottle in a brown paper bag. Being that close to the action of the play means the actors have nowhere to hide, and they don't. Rather they're all incredibly open and vulnerable and present in this messy situation. 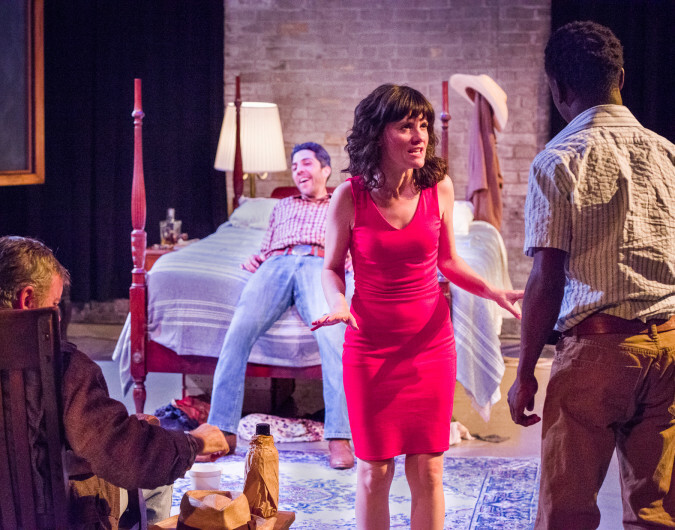 D&S Artistic Director Sara Marsh and James Rodríguez have a dark and intense chemistry, like magnets that both attract and repel, and are individually strong as well inhabiting these complex characters. Patrick Coyle is an ominous presence as the old man, the only actor who never leaves the performance space, saying volumes with the way he watches what's happening, with a grunt or a laugh or a drink. Rounding out the small cast is Antonio Duke as May's sweet and normal date who unknowingly gets involved with this crazy family. The whole cast works well together under Mel Day's direction, with great use of the almost in-the-round space. If you've never experienced Sam Shepard's work, Dark and Stormy's intense and gripping Fool for Love is a great place to start. And if you're already a Shepard fan, this is a good reminder that although the man is gone, his work continues to live on. 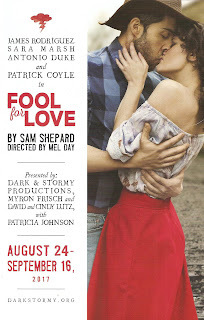 Fool for Love continues through September 16. The small space tends to sell out, so consider purchasing tickets in advance here (including a $15 ticket deal for those under 30). *Plot summary borrowed from what I wrote about the 2013 production at the Jungle Theater.